Almost everyone has heard of Twitter, but not everyone knows how it works and how it can be used professionally. However, Twitter can be among your more effective career development tools. And it doesn’t matter whether you’re interested in strengthening yourself as a professional in your industry or finding a new position. In fact, Twitter is especially relevant for job seekers, as The Wall Street Journal reports that Twitter is becoming the new job board and the new résumé. It’s more important than ever to know how to use this tool effectively, especially so close to Commencement. That’s why we’re hosting a free “Tweeting for Career Success” workshop here at the College on May 16 from 6 to 7:30 p.m. in rooms 51 and 52. Our featured speaker for the event is Rich Levin, a social media pioneer with over 40,000 followers on social media -- 21,000 of them on Twitter alone. Rich is Senior Vice President at Gregory FCA, the largest public relations firm in the Philadelphia region. In his 27 years as a journalist and media consultant, Rich has helped executives at some of the country’s top companies become more effective communicators. And effective communication is the key to professional success. Join us for this hands-on session and learn how to make Twitter one of the most powerful tools in your communications arsenal. 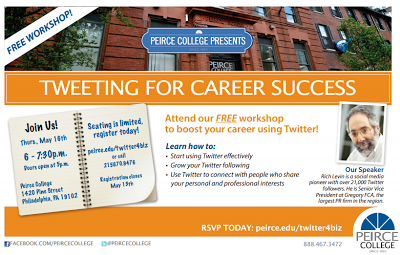 RSVP by May 13 to peirce.edu/twitter4biz.